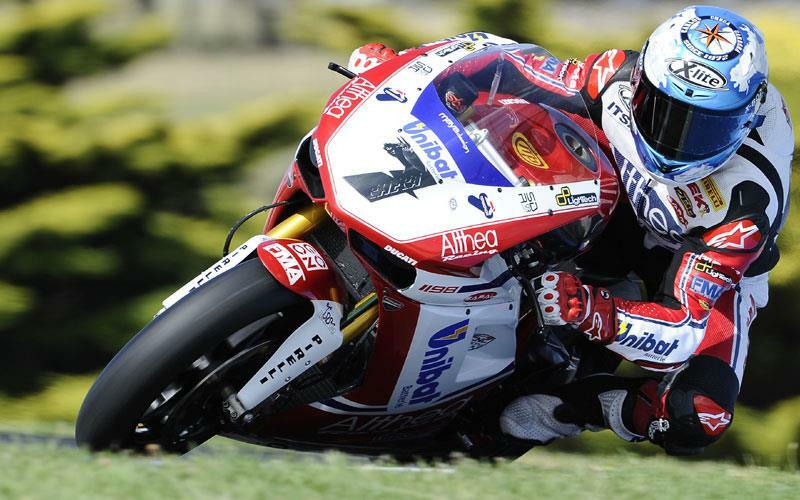 Carlos Checa rounded off a perfect weekend at Phillip Island with victory in race two to take home a maximum of 50 points and the World championship lead. Nobody was able to keep pace with Checa once he took the lead a few laps in, and he soon pulled away from the chasing pack. Max Biaggi again finished second, after a long battle with former MotoGP rival Marco Melandri, who went on to finish third. A trio of Brits rounded out the top six, with Jonathan Rea finishing fourth, and Leon Haslam and Leon Camier fifth and sixth respectively. Eugene Laverty was running in fifth place when he ran off track, eventually finishing 15th.